If you loved the simplicity of the Ditto, but found yourself longing for increased functionality, the X2 is the looper for you. New features are genuinely useful. Still simple to operate. Sounds great. With the Ditto, TC Electronic gave us an easy-to-use compact looper, but the new X2 targets seasoned loop fiends with a wealth of extra features. Aside from a larger enclosure, the most obvious addition is the FX footswitch, which can be used as a dedicated stop switch, or to activate effects (reverse and 1/2 speed), chosen by a toggle. "You can also transfer loops to and from a computer via USB"
You can also transfer loops to and from a computer via USB - another toggle stores and deletes loops, and along with the main level knob, adjusts the volume of a backing track transferred to the pedal. Finally, you get stereo inputs and outputs, plus true bypass, while power comes via a nine-volt power supply, or one or two nine-volt batteries. 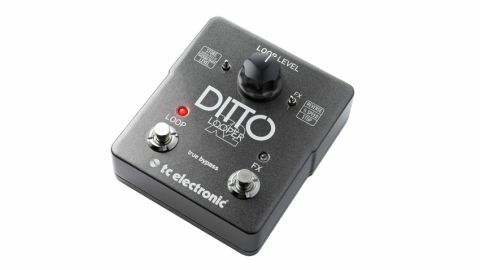 The Ditto remains simple to use: press the left footswitch once to record, again to play, again to overdub; press and hold to undo/redo, then press twice, or hit the right footswitch to stop, and hold to clear. You get five minutes of loop time, unlimited overdubs, analogue dry-through and 24-bit audio, for remarkably faithful sound reproduction. The effects sound great, too: 1/2 speed slows your loop and transposes it down an octave, while reverse offers instant psychedelia. To store or load a loop, you drag and drop on to your computer, although the pedal can operate only one at a time. TC has upped the Ditto's functionality while keeping the simplicity and audio quality that made the original a hit, and that makes the X2 a winner.